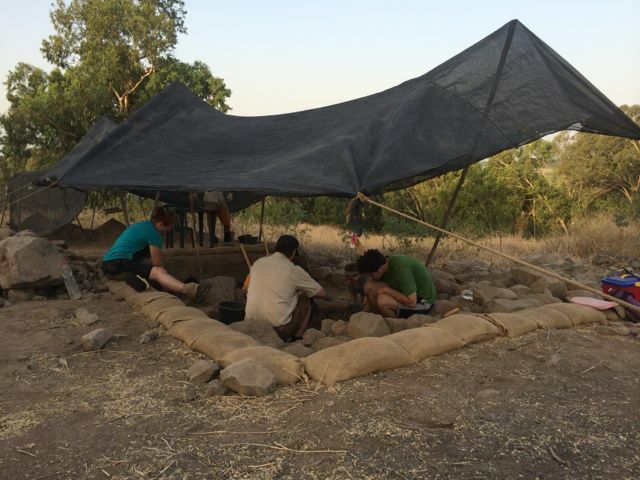 Today was our final day on the dig at Bethsaida for the middle session this year. There were no major finds, not even a few last minute coins. However, we did get to finish the square off nicely with clean baulks and a level floor. By the time time we stopped for breakfast at 9.00am the crew was in a celebratory mood. The team in Area T has been comprised of more or less even numbers of students from Charles Sturt University in Australia and Truman State University in USA. It has been a delight to see the relationships blossom as we make new friends, and move beyond politeness to genuine encounter. By the end of the two weeks we were no longer Aussies and Americans, but Bethsaida alumni. To summarise, we have found the continuation of wall W1202 into locus 4009, and most likely the continuation of W1200 from 2012 into L4009 as well. 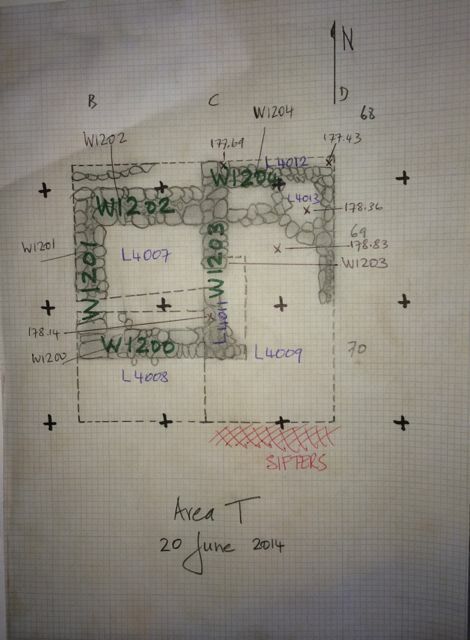 In addition, we have a new set of walls (W1203 and W1204) that date from a later period, running across the earlier walls and perhaps making some use of them. Further, we have an impressive doorway between L4007 and L4009. In the top right corner we found a pit used as a kiln to melt limestone objects ‘harvested’ from the more elite areas on top of the mound to create fertiliser. This most likely reflects the use of the site during part of the Ottoman period (1517–1918 CE). The pit/kiln helps to explain the three major sets of finds so far in Area T: (1) Roman nails, (2) Mamluk pottery and coins (1250–1517 CE), and (3) large numbers of Ottoman smoking pipes. 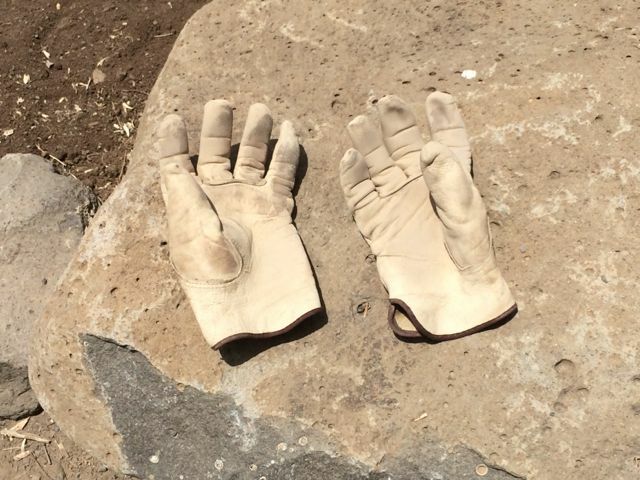 As we left the site today, I was struck by a pair of gloves left behind by one of the volunteers. The gloves seem to form a pair of praying hands. Are they praying for release from servitude, or for peace in the Holy Land? 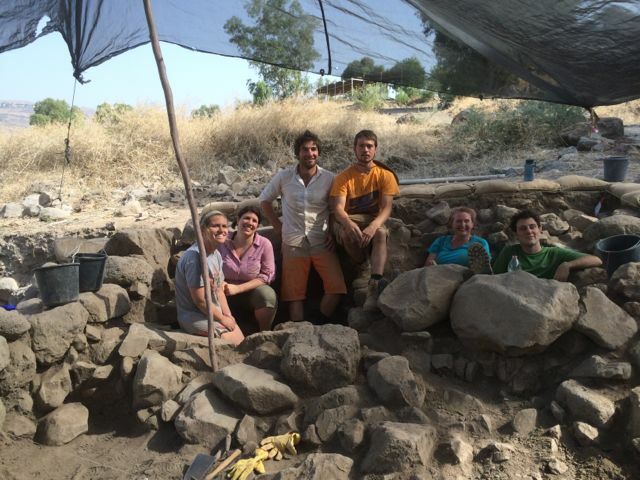 This entry was posted in Archaeology, Bethsaida and tagged Bethsaida. Bookmark the permalink. How come the Pit area is now number L4013, it was L4010?